The man who would one day sign himself Dr. B.E.J. 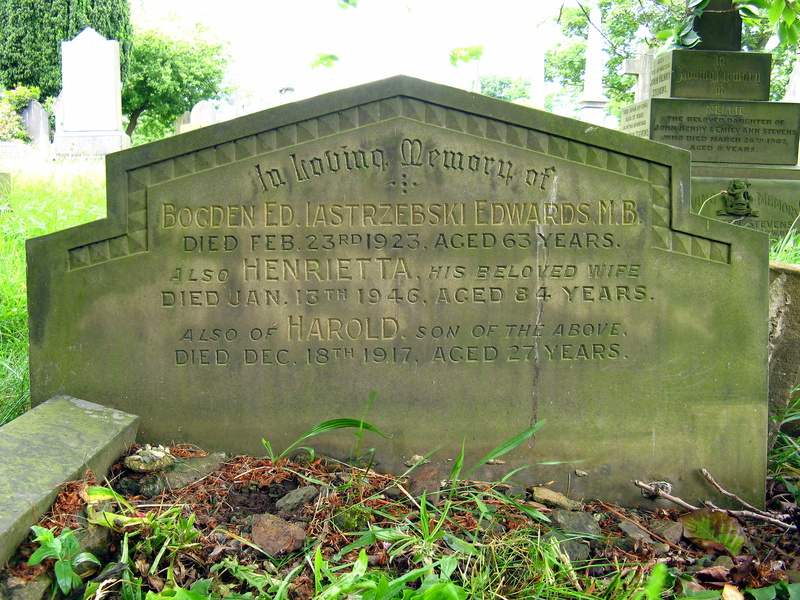 Edwards, was born Bodgan Edward Jastrzebski in 1860, the son of a Polish immigrant to Halifax. Always a promising scholar, he qualified in medicine from the University of Edinburgh in 1884. It is possible that during his time there he rubbed shoulders with Arthur Conan Doyle who was three years his senior, whilst he almost certainly studied under Dr. Joseph Bell, the inspiration for Doyle’s most famous creation, Sherlock Holmes. Shortly after qualifying, he changed his surname to Edwards, finding his Polish moniker a hindrance to his medical career. After several years serving as a house surgeon at Halifax Infirmary, he established a general practice, initially operating from 138 Elland Road at Brookfoot, where he resided with his new family. The house stood at the bottom of Freeman’s Woods opposite North Cut and whilst the row was demolished in the 1960s, its ivy-swathed ruins are still visible from the roadside. Brookfoot at the time was a thriving community, with its own Methodist chapel, Co-op store, school and an abundance of pubs. One such establishment, The Woodman, stood on the corner of North Cut, opposite Edwards’ practice. An outbuilding there often functioned as an impromptu morgue for the bodies of suicides dredged from the Calder, an act for which the riverbank at Brookfoot was notorious. It seems inevitable that as the village doctor, Edwards will have been called to attend such incidents. Edwards’ career went from strength to strength and in 1895, he was appointed Medical Officer of Health for Southowram (which at that time included Brookfoot). By 1901, he had moved to larger premises at 46 Bradford Road and later took the role of Medical Officer for Brighouse, Clifton and Hartshead. During the First World War, he established military hospitals at Longroyde in Brighouse and Boothroyd in Rastrick, for which he was awarded an MBE in 1920. He died in 1923, following a short illness. Edwards’ was tirelessly active in a number of organisations during his lifetime, including the St. John’s Ambulance Brigade, the Boys Brigade and the Scouts. He also had many more esoteric interests. For instance, he was a Master of Brighouse Masonic Lodge (No. 1301) and with his brother, Louis Stanley Jastrzebski, founded the Bradford branch of the Theosophical Society. Perhaps his most interesting association, however, was with that legendary and influential occult fellowship, the Hermetic Order of the Golden Dawn. The Golden Dawn (as it is commonly abbreviated) was founded in 1887 by three Freemasons and Rosicrucians, Dr. William Robert Woodman, Dr. William Wynn Westcott and Samuel Liddell Mathers. It was an initiatory society, which claimed to be the continuation of an ancient tradition descended from the original medieval Rosicrucians in Germany. This heritage was supposedly guaranteed by its foundation charter, the Cipher Manuscripts, although these documents later proved to have been forged. Nonetheless, even if the manuscripts were forged, they were clearly the work of an accomplished occult scholar and laid the groundwork for an intoxicating, unified system of ritual magick. The Golden Dawn’s synthesis of the various strands of the Western Mystery Tradition was so comprehensive and compelling that it remains the basis of much occultism today, incorporating Hermeticism, Qabalah, Freemasonry, Tarot, Enochian magic, astrology, alchemy, astral projection and much more. The Isis-Urania Temple was founded in London in 1888 and it quickly became a dominant influence in both the Victorian occult revival and the entire intellectual culture of the following decade, part of an outpouring of fin-de-siècle decadence memorably dubbed the Yellow Nineties. The society spread rapidly, establishing temples in Edinburgh, Weston-super-Mare and Bradford within the year. The latter was founded by Baildon watchmaker, Thomas Henry Pattinson, in rooms at the Alexandra Hotel, formerly on Great Horton Road. The Order’s most famous members were undoubtedly the poet W.B. Yeats and the libertine Aleister Crowley (later dubbed “the wickedest man in the world” by the British press for his exploits), whilst a host of lesser-known writers passed through its ranks, including Arthur Machen, Algernon Blackwood and Edith Nesbit. The Golden Dawn was also significant in the proto-feminist movement, with women such as actress Florence Farr and theatre manager Annie Horniman taking prominent roles in the organisation. Dr. B.E.J. Edwards joined the Golden Dawn in October 1888, making him one of the earliest members of the Horus Temple in Bradford, and adopted the motto “Deus Lux Solis” (meaning “God is the only light”). He quickly rose through the hierarchy of the society and was initiated into the grade of Adeptus Minor on 25th February 1893. As such, Edwards was now a member of the Second Order, responsible for directing the teachings of the junior First Order members. Achieving this grade required a considerable degree of occult study, which presumably took place at his home in Brookfoot. Edwards was clearly a very learned individual; in addition to his medical degree, he was a noted authority on ancient Egyptian civilisation and an accomplished linguist, who translated many documents from hieroglyphics, Assyrian and Sanskrit. It is evident that a polymath of Edwards’ capabilities would’ve been an asset to the Horus Temple, and he was eventually appointed Praemonstrator, responsible for doctrinal teaching. During the period 1892-3, the Horus Temple was riven by internal dissent, which forced first Annie Horniman, then Dr. Wynn Westcott and finally Samuel Mathers to travel from London to intervene. The affair resulted in the temporary resignation of T.H. Pattinson as Imperator, to be replaced by Dr. Wynn Westcott, and the expulsion of F.D. Harrison, who had served as Praemonstrator. When matters had settled down again, Pattinson resumed his former role, whilst Dr. Edwards was appointed to replace Harrison. The original incarnation of the Hermetic Order of the Golden Dawn came to an end at the turn of the century for a number of reasons, including the forced resignation of Dr. Wynn Westcott under pressure from the establishment; a number of public scandals which had exposed the society to ridicule; and dissatisfaction with the appointment of Florence Farr to preside over the Order in Britain whilst Samuel Mathers was living in France. Correspondence from 1900 shows that apathy had set in amongst the Horus Temple members. The Horus Temple finally disbanded in 1902, when T.H. Pattinson, along with Dr. Edwards, began to focus on a Higher Degree of Freemasonry known as the August Order of Light, Otherwise Called the Mysteries of Perfection of Sikha (Apex) and the Ekata (Unity), influenced by Hindu mysticism and the Royal Oriental Order of Sat B’hai. The Garuda Temple was established in the cellars of a pub at 81 Kings Parade in Bradford, with a membership largely cannibalised from the now defunct Horus Temple. Although, the Order had originally been founded in 1881 by Dr. Maurice Vidal Portman, a former governor of the Anderman Islands, Pattinson and Edwards extensively revised and augmented its doctrines. In this capacity Edwards became one of the most highly regarded Masonic scholars of the early Twentieth Century. Following his death in 1923, the Order published a memorial book titled “Masonic Secrets and the Ancient Mysteries” celebrating his contribution, which numbered the writer Rudyard Kipling amongst its subscribers. For more information on the activities of the Hermetic Order of the Golden Dawn and the August Order of Light in West Yorkshire, please see my blog post here. At the risk of being petty and/or in the interests of correct transliteration, a point about B E J Edwards’ first name. On the gravestone picture it says ‘Bogden’ and in the first paragraph of text it says ‘Bodgan’. The correct Polish is ‘Bogdan’ which means ‘gift of god’ or ‘given by god’. Interestingly, they got the most difficult Polish bit of the name right on the gravestone, ‘Jastrzebski’. I’m not trying to be pernickety, but am interested in how names of foreign origin change over the years, either within the family or through outside influences, through pronunciation or spelling. Fantastic website – you’ve uncovered (for me) a fantastic range of stuff that will fill up my string bag local knowledge and folklore for years to come. Keep on keeping on! Thanks for your comment, Stan. I’m really glad to hear that you’re finding the site enjoyable and informative. As for Dr. Edwards’ name, I think the use of “Bogden” on the gravestone must simply be a mistake on the part of the stonemason which the family couldn’t afford to correct. Every other source I’ve read – including copies of documents to which he signed his own name – show it as “Bogdan”. The Name is recorded as “Bogden” in the records of Brighouse Lodge.